WMF 3.0 RC is awesome. It was great in CTPs, even better in beta, but it improves with each following version. 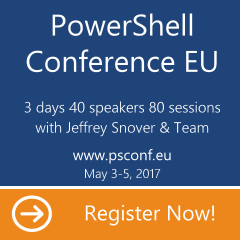 One of my favourite additions in RC depends on thing that existed in PowerShell 2, but it was ignored because we could not see any value in it. The reason for that was simple: it was just a metadata. Unless you would look closely at any command, including self-defined functions, you would never notice it’s there. It changes with version 3. Now knowing in advance what command will output can give authoring tools and hosts ability to act on this information. Select groups of code in ISE. New(er) ISE comes with lots of cool features. One of them is group-matching in editor. This is more than expected from modern editor. But wouldn’t that be handy to have possibility to easily select whole group? If you put cursor at the border of group – matching charter will be highlighted to simplify job. But for me – that’s too much work. How about simple function that would select whole group for me?